Have you ever seen this floating around Pinterest? I have, and with just a few minutes to make lunch today, I decided to try it. With a few additions, of course. 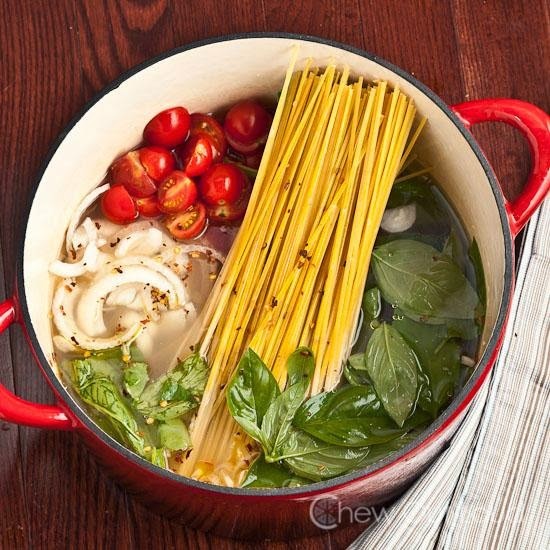 The idea is that you throw these things into a pot together and they all cook down at the same time, leaving you with delicious pasta and sauce. The reality was a little different. Put all of these things, except for the cheese, into a pot of boiling water. After about 10 minutes, realize that things are as cooked as they should be, and try to stealthily drain out the water. Don't let things escape down the drain! Return to stove with about 1/2 a cup of water still in the pot, and cook a bit more. Then chop up your string cheese and throw it in there! Serve with parmesan and pepper, if you like. Be only slightly mad that the recipe required draining, because it still tastes pretty damn good. This looks so easy and your additions made it look even yummier! I might have to try this. Doesn't surprise me that it didn't turn out as easy/delicious as Pinterest said it would. Lol. :) Yeah, I was a bit skeptical, but thought I would give it a try!